French estate platinum eternity band with fancy color diamonds: Description by Adin Antique Jewelry. 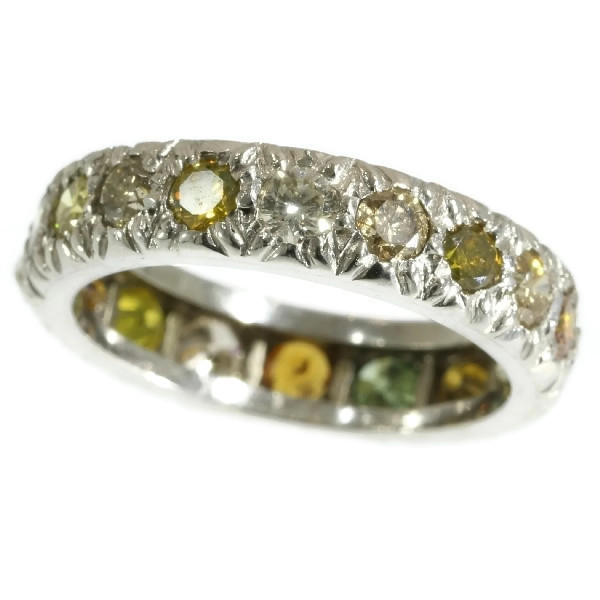 The orange, green and every colour in between of the 18 brilliant cut diamonds in this platinum eternity ring from 1950 will keep spicing up your life. All around embellished with diamonds, this band symbolizes everlasting adoration and allegiance. Fancy Colored Diamonds - A chemically pure and structurally perfect diamond is perfectly transparent with no hue, or color. However, in reality almost no gem-sized natural diamonds are absolutely perfect. The color of a diamond may be affected by chemical impurities and/or structural defects in the crystal lattice. Depending on the hue and intensity of a diamond's coloration, a diamond's color can either detract from or enhance its value. For example, most white diamonds are discounted in price when more yellow hue is detectable, while intense pink or blue diamonds (such as the Hope Diamond) can be dramatically more valuable. Diamonds occur in a variety of colors — steel gray, white, blue, yellow, orange, red, green, pink to purple, brown, and black, virtually in every color of the rainbow. Diamonds: 18 brilliant cut diamonds in various colors such as orange, brown, green, yellow, pink, lemon and with a total estimated weight of approx. 1.40 crt. Note: All diamond weights, color grades and clarity are approximate since the stones were not removed from their mounts to preserve the integrity of the setting. (approximate color and clarity: vs/si). We also do NOT know if the diamonds are natural or treated. Especially blue diamonds are so rare that normally one could expect them to be treated. Total diamond weight: approx. 1.40 crt. Resizing: This ring can only be resized a bit in both directions so please ask in advance for the possibility to make it into your size.